This happened yesterday, very hot summer and most of the insects were too active for photos. 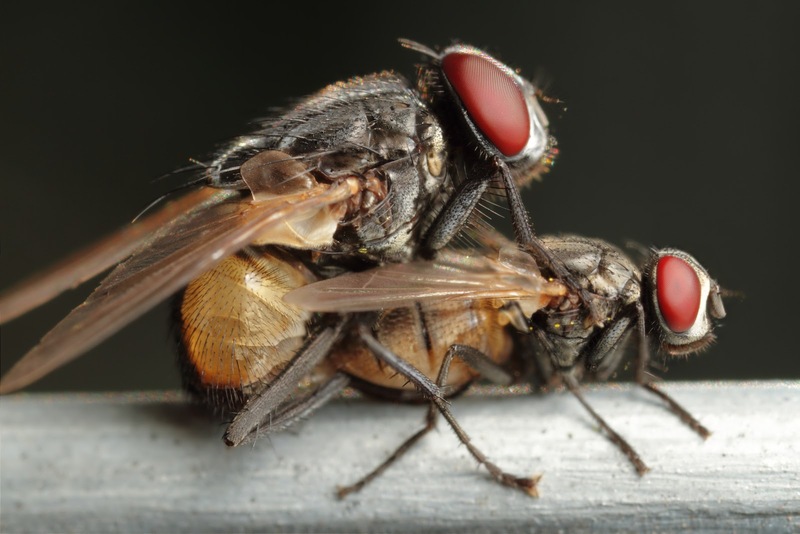 In situations like this the few steadier ones are in the moment of mating or feeding, just what happened to these nice couple of flies. They were mating in the fence of my home, later afternoon and the sun was opposite to their bodies in the photo, this explain the relative background light and some light in the amber parts of their bodies. 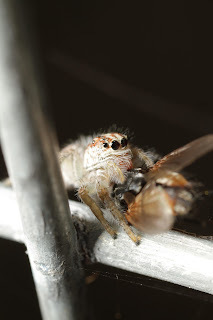 This is a combination of two photos, with Canon 7D and Canon MP-E 65mm @ about 2 x magnification, one photo had the body of male in focus and other the body of female, joined the two by working with layers in GIMP software, a process called focus stack. The photo used Canon 580 EX II flash diffused and about 1/4 or less manual power to illuminate the flies, that could appear shadowed is the photos were taken at natural light. For a scene like this the manual setting of the flash is my personal preference, the light rays from the sun hit the lens and could make things difficult for ETTL to correct measure the scene, so you would need to dial the ETTL compensation up in a guessing game, I prefer the simplicity of the manual control. There was enough time to make two videos, one against the sun of very bad quality but the with some transparencies in the abdomen were is possible to see the movement of internal organs, and the second with the sun with incidence into the flies that document the external activity of them.